A new joint venture company, Ocean Geo-Frontier, featuring Japan’s Nippon Yusen Kaisha (NYK) with a 45% stake, Norwegian marine surveyor PGS Geophysical (34%) and Japanese conglomerate Hitachi (21%), has won a deal with Japan Oil, Gas and Metals National Corporation (JOGMEC) for geophysical surveys to be conducted by a three-dimensional geophysical survey vessel. In 2018, the Japanese government moved ahead with plans for more surveys around the local coastline to search for new oil and gas fields, something OGF will now be assisting via a ship, dubbed the Toblerone vessel when it was delivered by Mitsubishi Heavy Industries 10 years ago for its triangular shape. 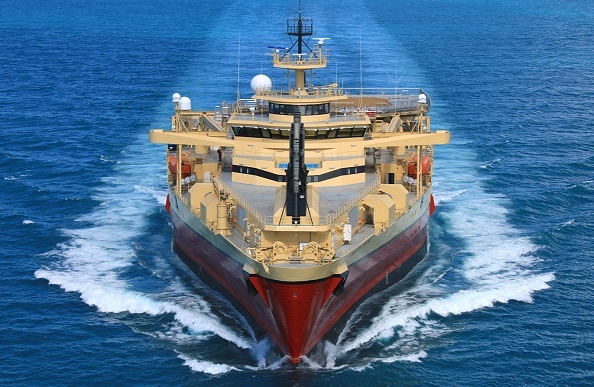 OGF will use JOGMEC’s red-hulled seismic vessel for geophysical surveys for the next 1o years under the new contract, marking NYK’s entrance into a new business segment as part of its energy shipping diversification plans. “To detect oil and gas fields a few kilometers below the seafloor, seismic waves are artificially produced through a sound source known as an air gun, and by receiving the seismic reflection from the sea bottom on the over 8 kilometers of streamer-cable and analyzing the acquired data, a detailed picture of the crustal structure below the seafloor may be obtained,” NYK explained in a release.